Legacy was not exactly what I expected. Judging by the cover, I expected something a little more modern. That was not exactly the case. That was my fault, as I know better to judge a book by its cover! The main character, Alera, was a strong character. The Women in her time were not to be dominant at all, the men were the rulers. Alera hated this, and she wanted to have an opinion, and she wanted to be involved. I liked that about her. Not that the men actually listened to her very often, which I found frustrating. I did not like her future husband to be at all. Steldor was a jerk, who thought himself to be perfect. I did really like Narian. I found him to be a mystery, and never did figure him out. I also Loved London, he really made the story more interesting for me. The book started out a bit slow, and didn’t really pick up for me until after the second half of the book. The writing was beautiful, albeit very descriptive. The plot was very creative, but very confusing in some parts. The ending was somewhat a cliffhanger. I will definitely be picking up the next book, as I’m curious as to what will happen next. Overall, this was a good read for me. I enjoyed reading it, and am looking forward to seeing where the author takes us in the next book. This book sounds really interesting. I am all for more strong female characters. Descriptive writing can be good when done right, and it sounds like you enjoyed it for the most part. Great review! This seems like a pretty good book. I'm going to be reading this next month so we'll have to see what I think! This cover is just phenomenal. I can see why you wanted to read it. Now I want to read it because it does sound interesting. I have been seeing this book all over the place and am interested to read it myself. 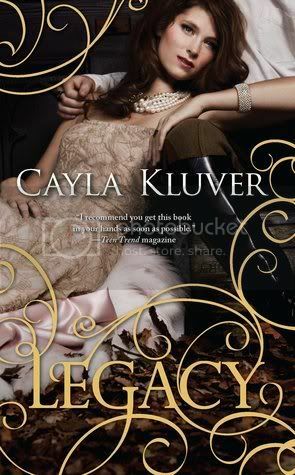 Legacy is on my TBR pile, but I at the moment I am not looking for slow reads!